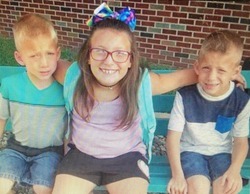 The twins Masters Xzavier Patrick Ingle, 6, and Mason Thomas Ingle, 6, and their beloved big sister Miss Aliva Faith Stahl, 9, of Rochester passed away on Tuesday, Oct. 30, 2018, from injuries sustained in a motor vehicle – pedestrian accident. Twins Mason Thomas and Xzavier Patrick and were born March 28, 2012, in Logansport to Shane Ingle and Brittany Schwab Stahl. They arrived at 29 weeks, weighing in at about 3.14 pounds each. Much of their early life was spent in the NICU.The two adorable blue-eyed tow heads were growing up northeast of Rochester, near the Tippecanoe River. They joined big sisters Selena and Alivia. Both were currently attending 1st grade at Mentone Elementary School, as members of Mrs. Cody’s class. With an appetite for adventure, Xzavier and Mason enjoyed exploring outside, and at school looked forward to fun and games of tag with friends at recess. Their school chums remembered them for their trademark butch haircuts topped with a dab of butch wax in front to garner the stand-up hair look. At home Mason and Xzavier were shadows of the Daddy. Together they tackled small building projects, like adding a porch to their home. They helped him dig holes. Mason and Xzavier loved playing video games, jumping on the trampoline and had fun playing with their cousins. Mason’s favorite colors were red and yellow. He was a big fan of everything Pikachu. Xzavier liked green and blue. He loved everything Pete the Cat. Both boys loved monster trucks. They once attended a Monster Jam event. Their adventurous side is noted with their love for snowmobiles and 4-wheelers. Next summer they looked forward to playing youth baseball in Mentone. Treasuring the memories of Xzavier and Mason are their parents, Brittany Stahl and Shane Ingle of Rochester; a sister, Selena Stahl; grandparents, great grandparents, aunts, uncles and cousins. The amazing twins, loving and vibrant Mason and Xzavier, will forever be remembered by their family, friends and class mates and continue to live in our hearts. As Thomas Campbell once said, “To live in hearts we leave behind is not to die.” Rest in peace little ones. Mason and Xzavier’s family will receive friends from 4-8 p.m. Friday, Nov. 9, in the Good Family Funeral Home, 1200 West 18th Street Rochester.